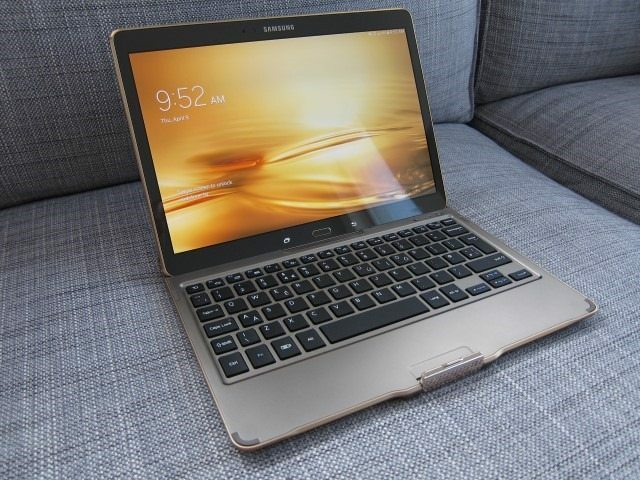 Samsung’s previous attempt at a tablet keyboard was the Book Cover Keyboard for the NotePro/TabPro. 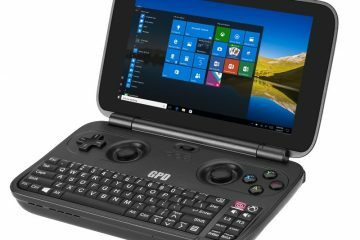 While it had the matching leather material and could double as a cover, it simply felt like any external Bluetooth keyboard and didn’t integrate as well with those tablets. 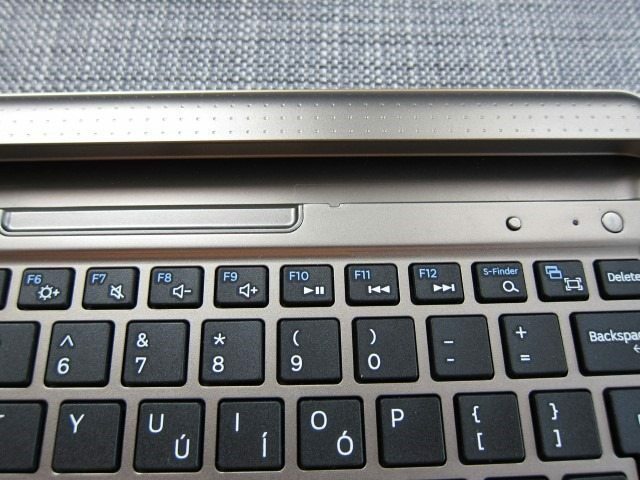 You had to awkwardly remove the tablet from the keyboard, release the latch that holds the tablet up and finally dropping the tablet in the bay. 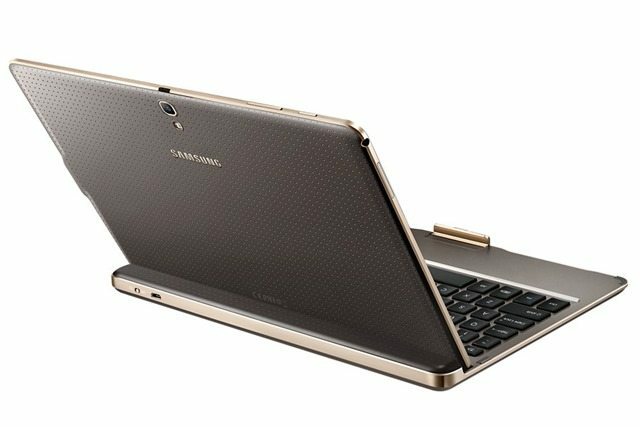 Samsung’s latest attempt, the Book Cover Keyboard (EJ-CT800) for the Tab S 10.5 is still an external Bluetooth keyboard and cover, but have Samsung learned their lesson? 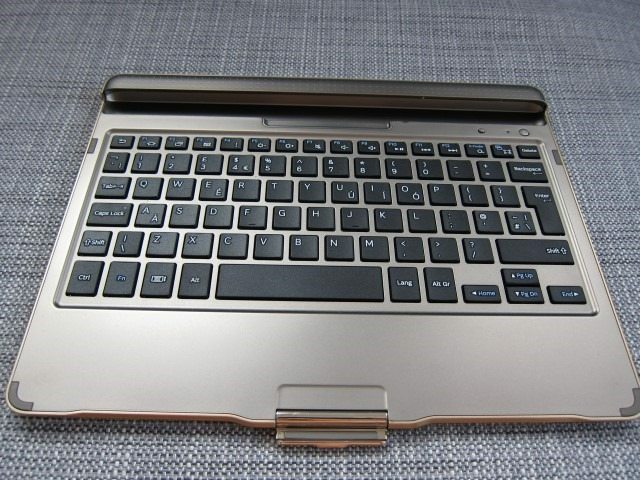 The Book Cover Keyboard EJ-CT800 comes in two color White and Bronze, matching the the colors of the Tab S 10.5. 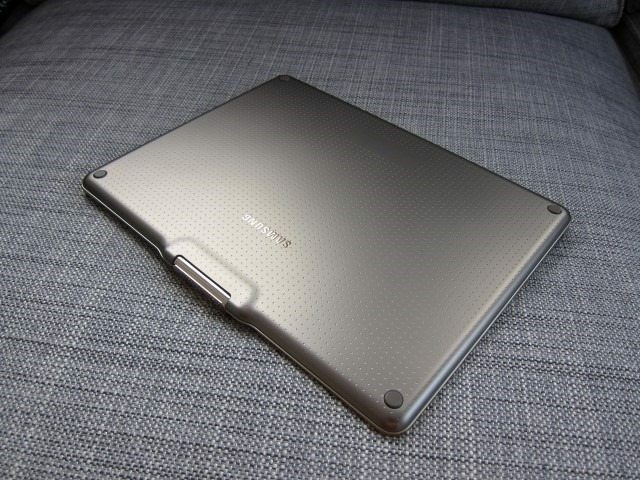 They’ve recently released a dark Gray Tab S, but strangely there isn’t a matching book cover keyboard color. 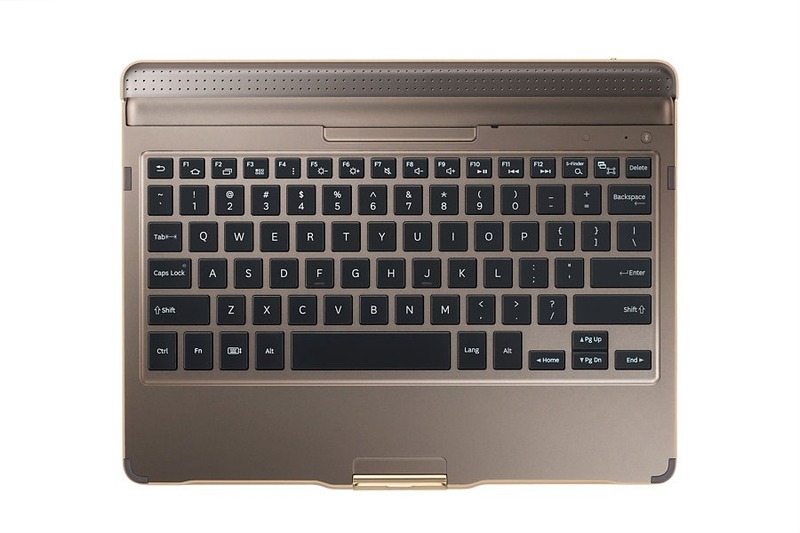 As the name implies, it’s an external rechargeable Bluetooth keyboard that will also double as cover for the screen. 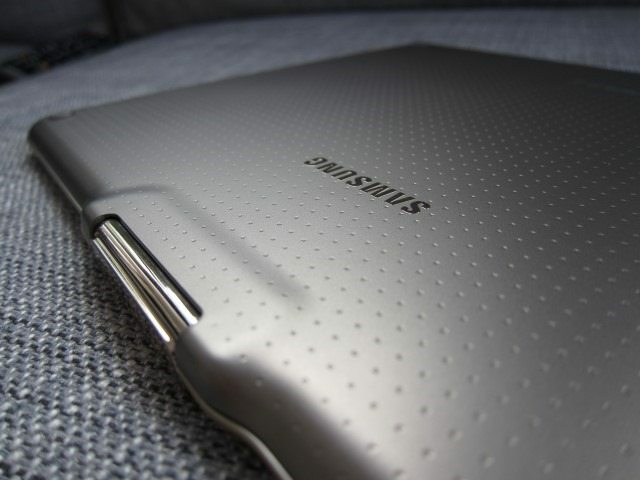 The keyboard runs on a 200mAh battery which according to Samsung is good enough for 120 hours of continuous use, while Bluetooth 3.0 covers the connectivity side of things. 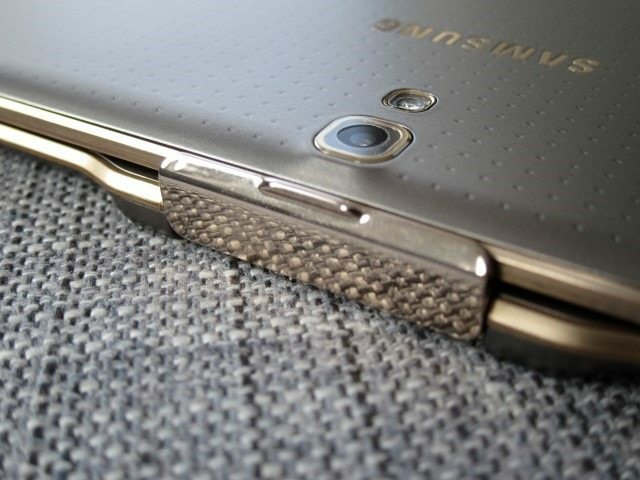 While the EJ-CT800 protects the screen, the back of the tablet, including the camera module remain unprotected. From a design perspective the keyboard uses island-style keys with a concaved top that are slightly more comfy than a fully flat design. 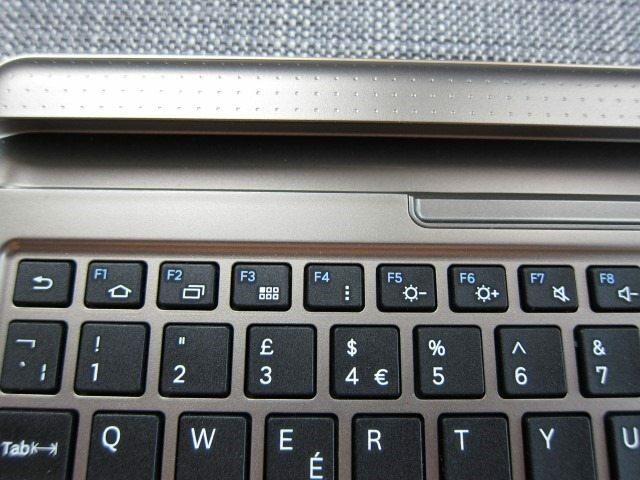 The keys are Black on the Bronze keyboard and White on the White keyboard. 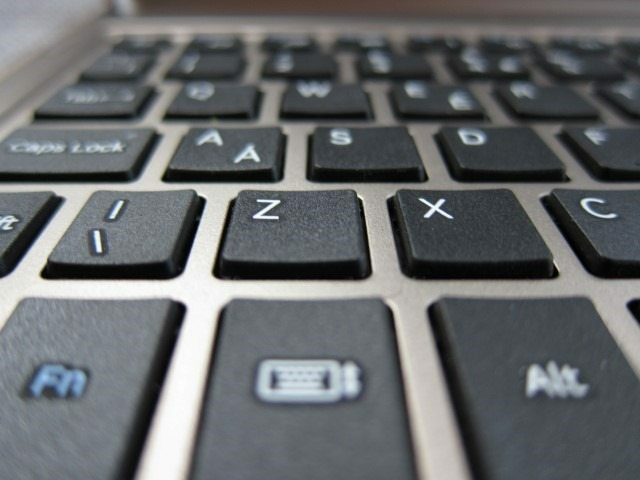 These keys use a combination of the tradtional F keys which can be activated by pressing the ”Fn” key and Android specific functions, with the latter being the default action. 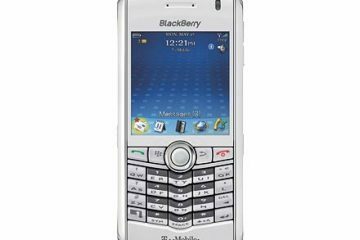 There are for example the expected Back, Home and multi-task button, but also a button to open the app drawer, menu, media and volume controls, brightness controls and even search and screenshot buttons. The system even recognizes standard Windows shortcuts like Ctrl+V for paste. 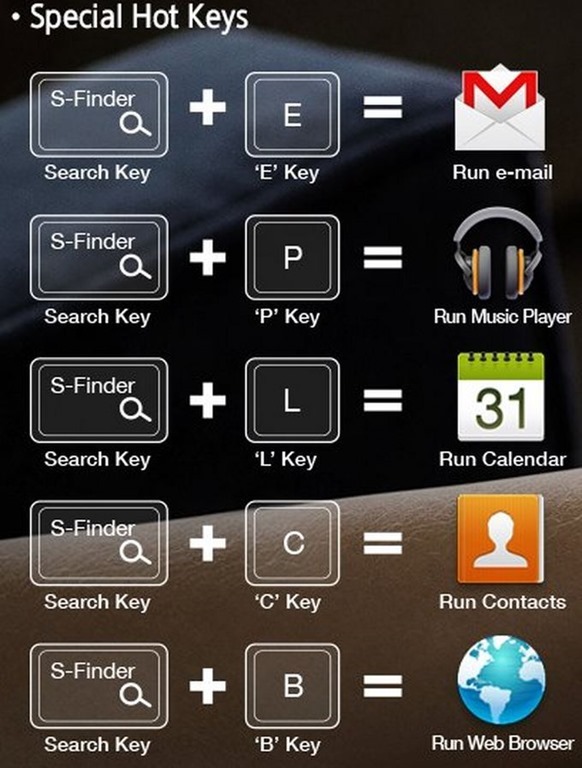 Samsung has even gone as far adding special hot keys, which are a combination of certain keys and the Search/S-Finder key. One feature we really miss are backlit keys. Especially at this price, it’s something we would expect and something Samsung should consider on future versions. 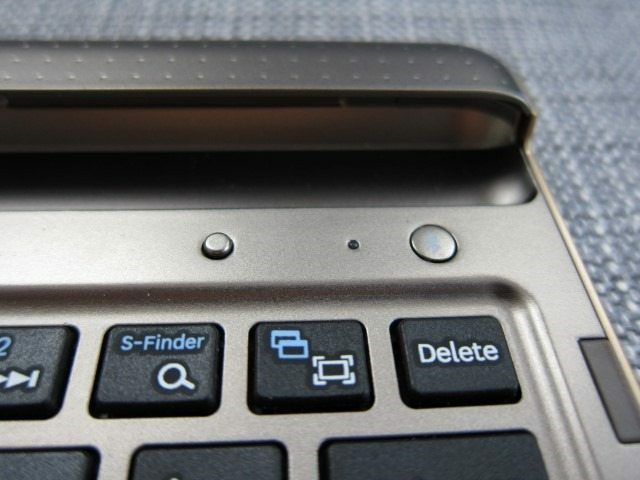 Sitting above the keys, you’ll find the Bluetooth button, notification light and lock button. 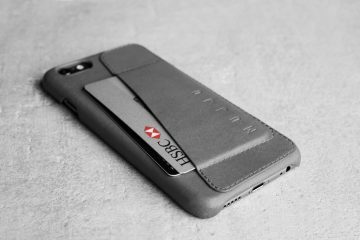 The Bluetooth is used to start pairing, while the notification light isn’t tied to incoming notifications, but rather informs you of the charge status, Bluetooth status and pairing. 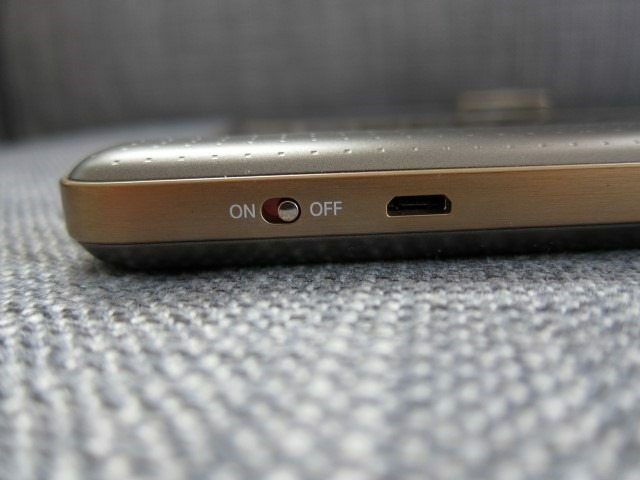 The lock button is designed to put the keyboard to sleep and signal the screen to turn off when the keyboard is used as a cover. This allows you to quickly close the tablet like you would with a laptop, all while automatically conserving the tablet and keyboard battery. 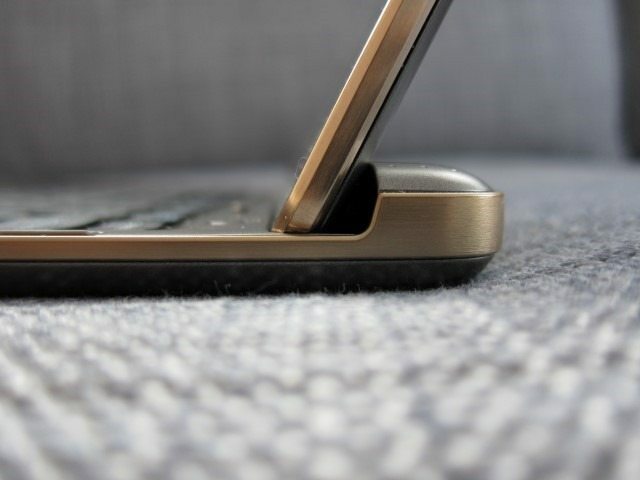 Around the edges of the keyboard there are 4 rubber feet that raise the tablet’s screen slightly above the keys, preventing the screen from coming in contact with them and preventing scratches. 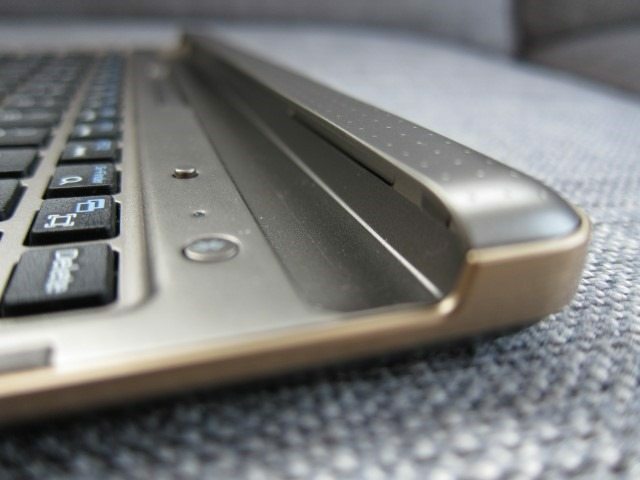 The two most notable changes when compared to the NotePro/TabPro’s keyboard is the fastener clip and integrated holder and slot. 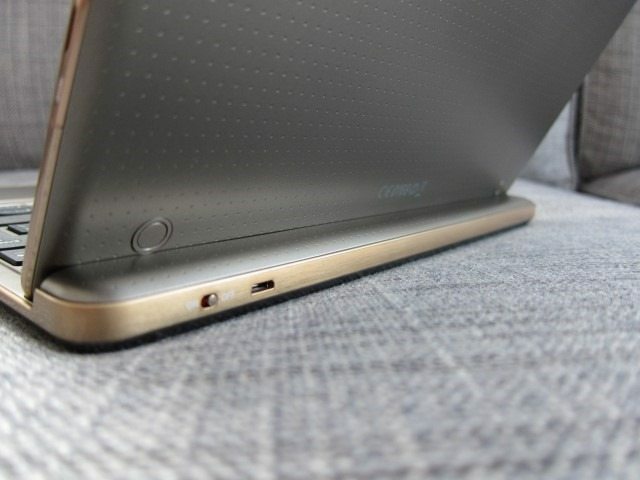 The slot acts as a resting place for the Tab S when it’s sitting angled in the keyboard. 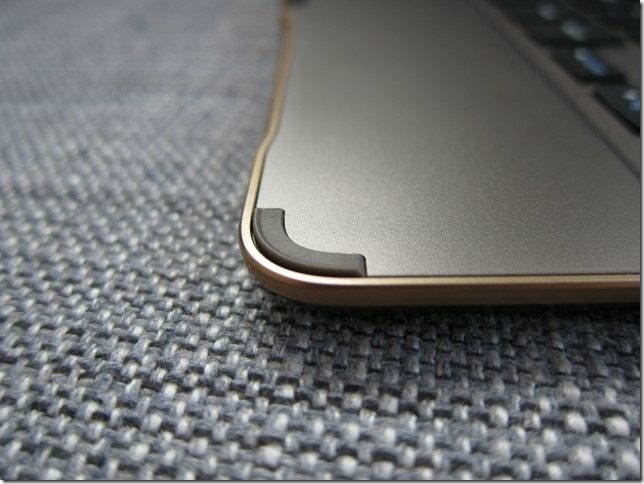 The slot has enough space to allow the tablet to go from the open position to closed in one smooth motion, similar to a laptop. 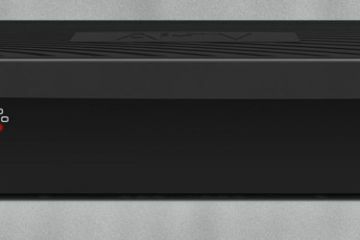 At first I was concerned about the fact that the slot lacks a rubber strip and as a result would cause scratching because of friction. 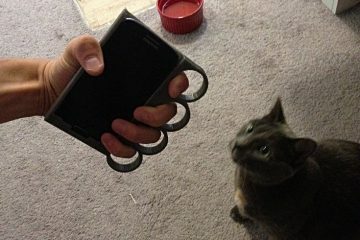 Luckily, after testing the this for a few weeks now, it doesn’t cause any scratching. 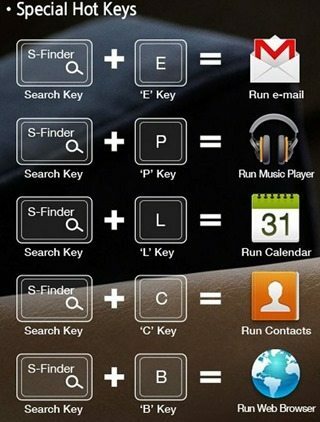 This is probably something that Samsung must have tested and decided that it wasn’t necessary. My ussage of the the keyboard seems to support this. 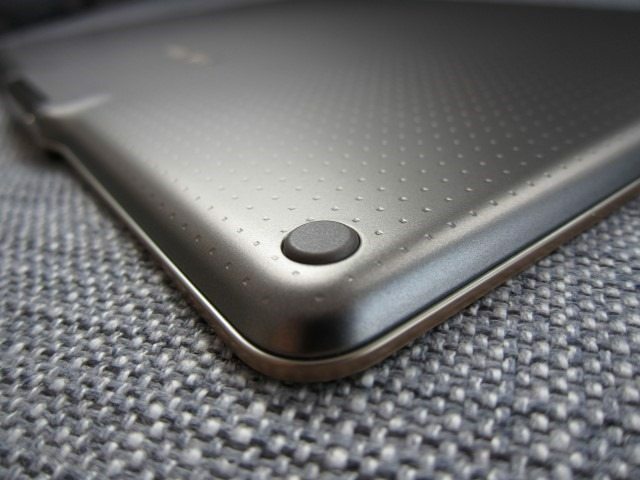 The integrated holder’s main purpose is to simply act as place for the tablet to lean on when open, as the slot simply isn’t enough to keep the tablet upright. 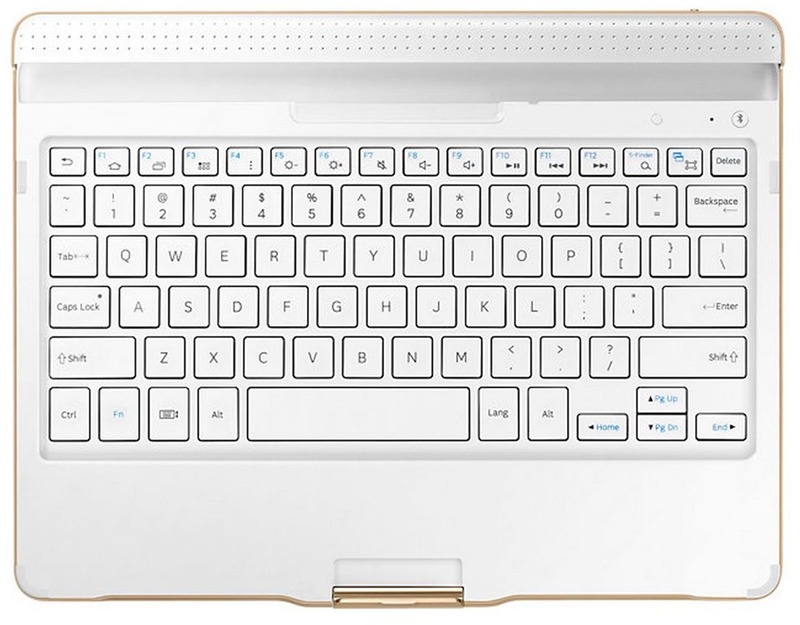 It’s a more compact, elegant and integrated solution when compared to the Tab/NotePro keyboard which required you to raise this huge flap before using the keyboard. Because it’s a moving part and because it’s such a large flap, it seemed like it could easily break. 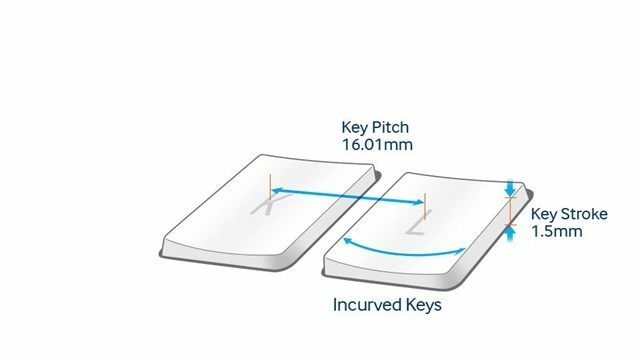 This solution is integrated into the design of the keyboard and with no moving parts, it’s an overall more sturdy design. 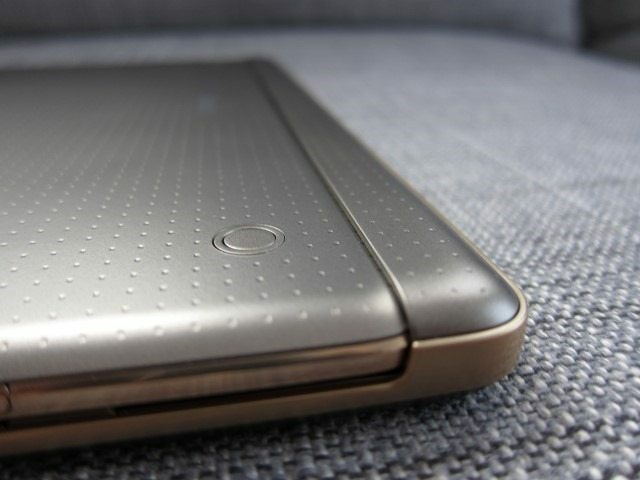 With the unit closed, it continous the lines of the tablet creating this laptop-like look. 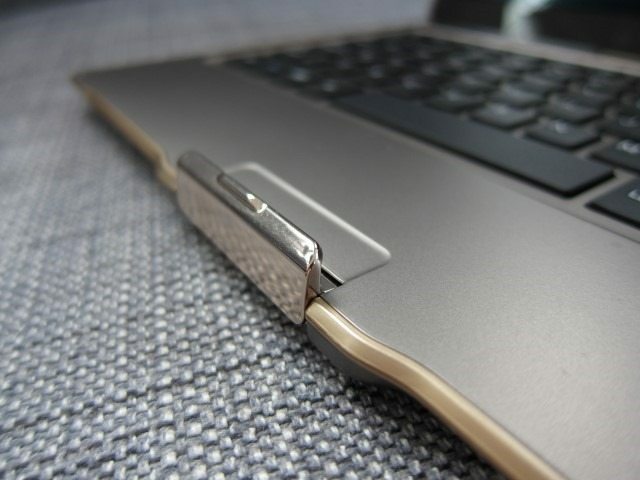 The fastener clip keeps both the keyboard and tablet securely closed and aesthetically speaking it makes quite a statement, looking almost like a piece of flashy jewelry. 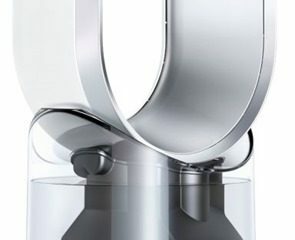 The fastener needs just a small push and will automatically close with quite some force. 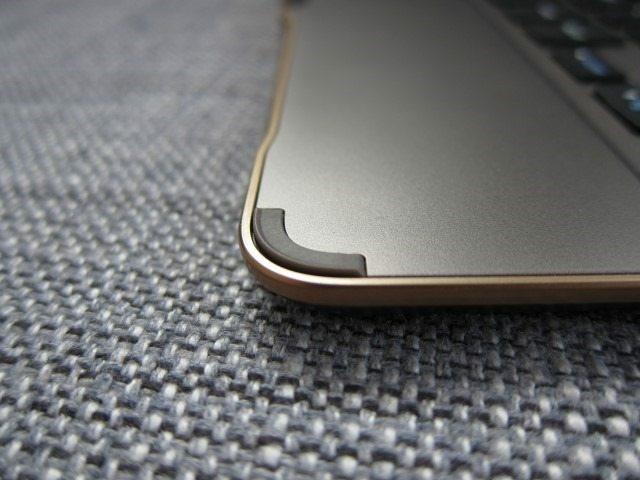 Luckly the designers added a small rubber strip to prevent scratching or damage. 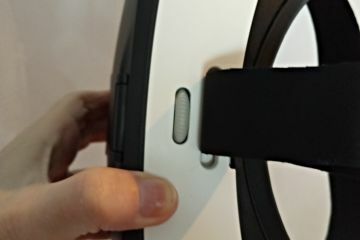 Behind the holder there’s the On/Off switch and the microUSB power port. Despite having a rather small 200 mAh battery, charging was rather slow using the Tab S’ charger. Samsung’s specs sheets supports this, indicating that it should take about 2 hours to charge. Luckily, the keyboard’s battery life is really good, which makes charging something you won’t be doing often. On the bottom of the keyboard, Samsung used the same dimpled leather texture found on the back of the Tab S, while four rubber feet slightly raises the keyboard tp prevent the beautiful finish from getting scratched. 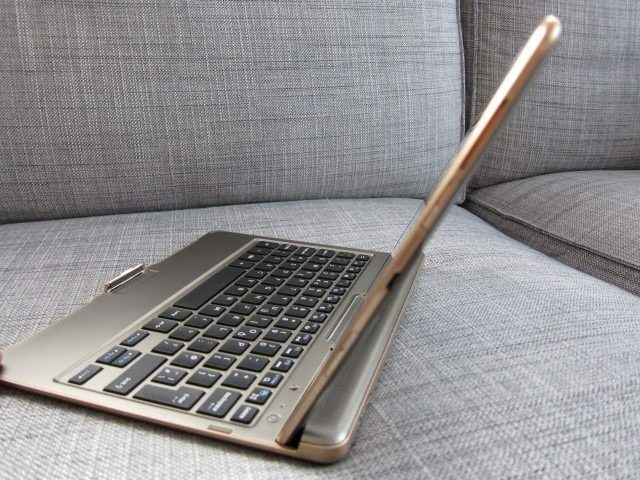 Typing on the keyboard was a treat, in fact this entire review was written using the Tab S and Book Cover Keyboard combo.The keys are quiet, even more than many laptops I’ve used and provide ample travel, enough not to be too shallow, but not too much to give this mushy feel. Most of the time I do my typing in low-light conditions, which is why I would have loved to see backlit keys and at this price range they should have been included. I also liked the fact that that I can open a close the tablet like a laptop and have both the keyboard and tablet go into sleep mode. 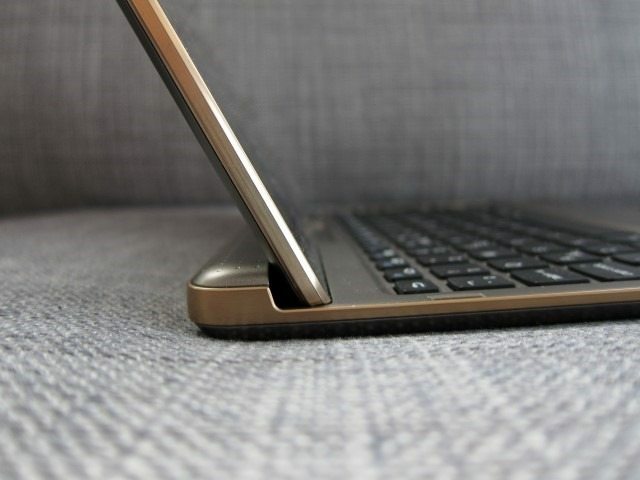 But perhaps the most notable feature of this keyboard is the design. 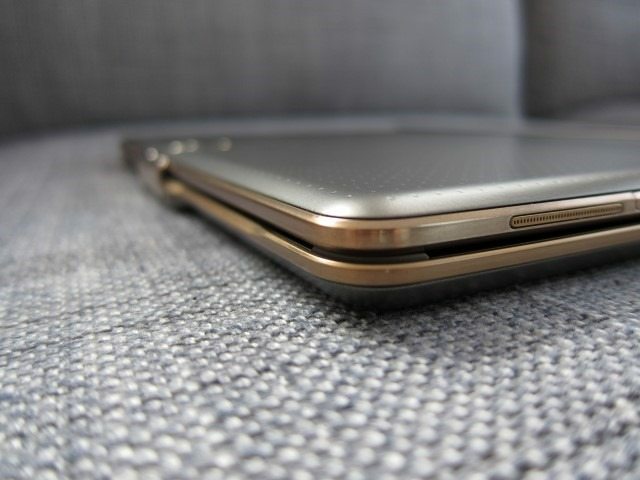 Its design complements the tablet, creating this netbook look and feel, while the fastener makes this fashion statement, looking almost like a piece of jewelry. 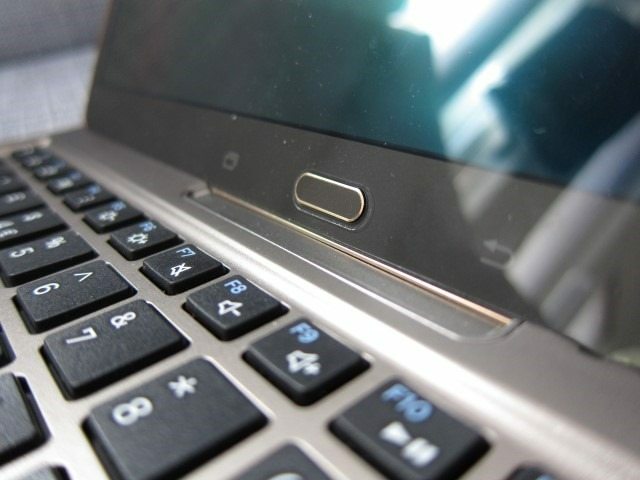 The keyboard and tablet combo is light enough to be ultra mobile and thin enough to match any modern netbook or ultrabook. Lag was also never an issue. 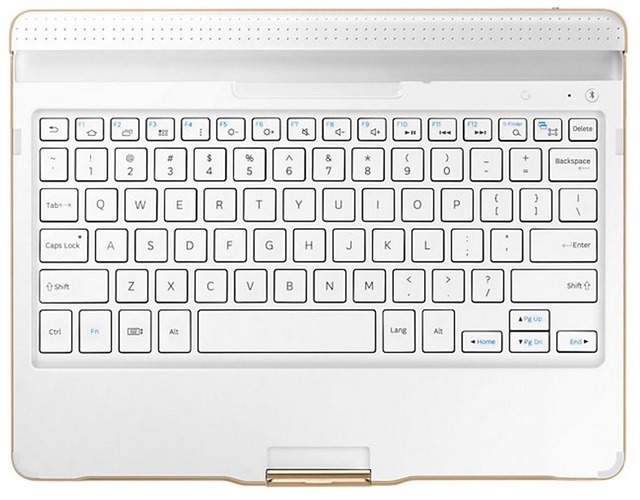 The only thing this keyboard really needs are backlit keys. It gets a 9 out 10. 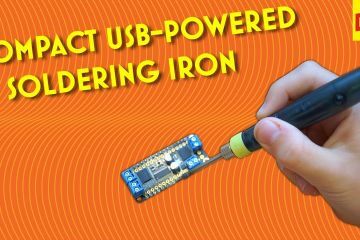 I just bought one of these brand new from an ebay.com seller. The price? $19.98 including free delivery. 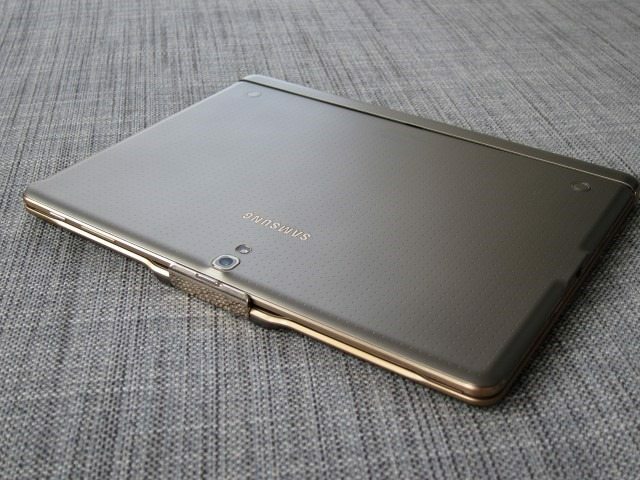 I should receive it this weekend and will finally turn my Tab S 10.5 into the device it was surely destined to be.